Unusual sqaure rondela adorn each corner these a rare. This glass seems to glow with a light of its own in the half light at dawn or dusk or sometimes on a cloudy day. 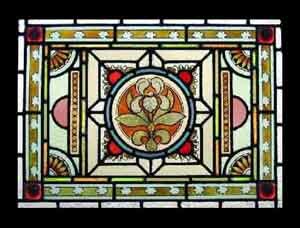 It is an attribute of this heavy old glass to collect and softly diffuse the colours of the light falling upon it. The frame measures 32"W x 23 3/4"H . The glass measures 30 " x 21 3/4"